Spending most of the year sailing Australia and the South Pacific, Sea Princess has cruises departing from Auckland, Brisbane, and Sydney. Cruise the islands of the South Pacific including Fiji and Papua New Guinea, explore the nature and culture of New Zealand, or discover more of Australia’s coastline. Give cruising a try with one of Sea Princess‘ getaway cruises or for a longer voyage, jump onboard one of her world voyages or segments of world voyages with cruises departing from Australia, London or New York. 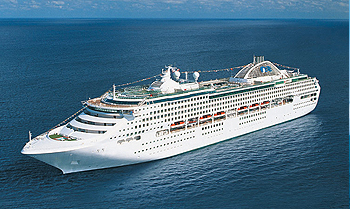 View all Sea Princess cruises, view a selection of Princess cruise deals, or view more options for Princess cruises. Step aboard Sea Princess and prepare for a vacation that will dazzle your senses. From the four-story Atrium to tantalizing dining options, a Vegas-style casino and a variety of incredible entertainment choices, including Movies Under the Stars, you’ll find a relaxing retreat that’s as captivating as the places you’ll visit on this grand vessel.